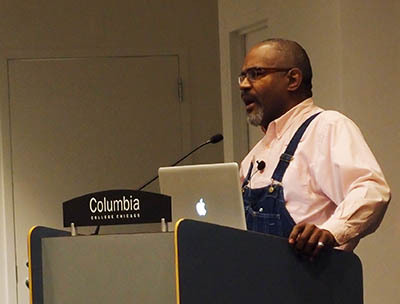 Amos Kennedy brought plenty to look at to his lecture last Friday night at Stage Two. 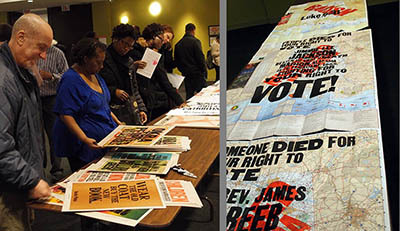 Examples of his activist posters, some experimental pieces, and posters he described as “just what I do” were on hand for all to see at what was the kick-off for a three-day workshop at Columbia College. 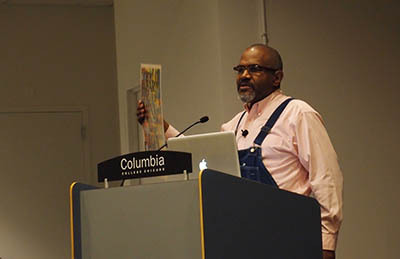 Kennedy is visiting the Center for Book and Paper Arts (CBPA) and Center for Black Music Research (CBMR) to lead an interdisciplinary arts department graduate seminar in letterpress printing, drawing on the extensive collection at the CBMR archives. Kennedy has recently moved to Detroit, MI after working out of a nondescript storefront in Gordo, Alabama for years as owner and operator of Kennedy Prints. He has been profiled as the subject of the documentary film Proceed and Be Bold! and is one of the country’s leading letterpress printers, having joyfully and exuberantly printed thousands posters for commercial, cultural, and activist organizations and causes. The workshop continues at the CBMR and CBPA through this weekend, and the letterpress results will be collected into sets, as well as exhibited later in 2013. For more about Kennedy Prints, click here.